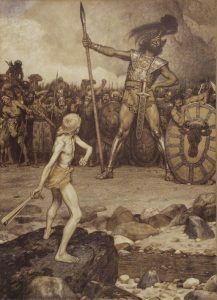 “Is There not a cause?” asked the shepherd David in Israel 3,000 years ago, when he witnessed the fear of Goliath among his fellow countrymen. It’s bad enough when the enemies of your own life overwhelm you with fear. But when the enemies of your whole culture, indeed of the very kingdom of your God, are openly hostile to the absolute values and objectives of life itself, do you think we might possibly be encouraged by this memorable ancient landmark recorded so specifically for us in our Bible? Do you think that our generation could use some hope? Do you sense that Christians and non-Christians alike are feeling overwhelmed by the “Goliaths” that threaten our very existence in today’s world? 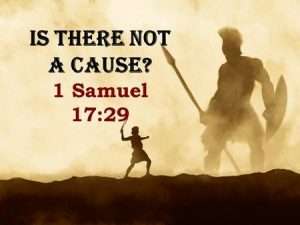 Take a little time to personally review the story of David’s encounter on the battlefield with the giant Goliath in first Samuel 17. There are lots of Scriptural encouragements. We must continually reflect on them when facing fearful conditions. Those causes may make us faint or recoil from the calling of God on His people and on us individually. We need strength that comes from His Word. … Let’s read the whole passage beginning after Goliath’s cursing of David, at verse 45. Does that remind you of the work of Nehemiah in ancient Israel? With all the negative and seemingly hopeless conditions surrounding our generation, do you think God, the Holy Spirit, might be speaking to us to “encourage one another day after day?” Read Hebrews 3:7-19. Today’s poorly taught Christians need to rediscover the implications of what is written in several places like Hebrews 10:12-13 about the cause to which we are assigned. Who does the world belong to? When you think about the enemies of God in the world today, do you have your hope in God or in man to deliver the righteous children of God by the grace of our Savior Jesus Christ? The Devil may be “the god of this world (system)” the idol of people who ignore God Almighty, but that does not mean that Jesus has revoked the authority and jurisdiction that was validated by His resurrection. When Jesus decreed from the cross, “it is finished” what remained yet to be done? When does the end come? Are there enemies yet to be abolished besides the last enemy of death itself?